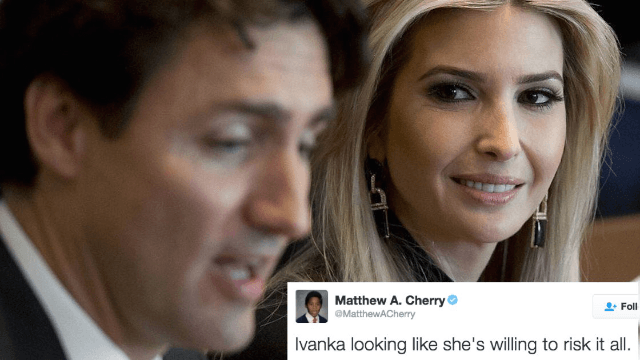 Ivanka Trump caught gazing thirstily at Justin Trudeau, gets hilariously memed. ICYMI: Justin Trudeau (you may know him as "Joe," but his name is Justin) is a mega-babe. And in addition to his devilish good looks, he runs the country where many of us have considered moving in the past few months: Canada. Many of us missed out on another poignant moment: the US President's daughter, Ivanka Trump, gazing at the Canadian PM with a look of what can only be described as smoldering forbidden lust. See you in Canada, Ivanka.